Shopping for healthful foods doesn’t have to put a dent in your budget, and it doesn’t have to be hard. Learn what product labels mean and some tips to make your grocery shopping easier. 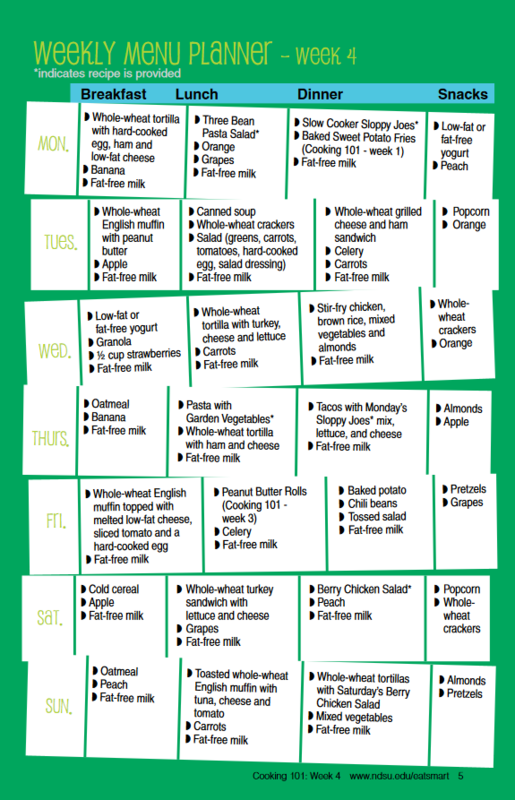 Make a weekly menu plan. This will help balance your diet and aid in making a grocery list. Make a grocery list and organize it according to the store layout. This will save you time and help you stick to your budget. Aim to try a new fruit or vegetable each week. Eat before you shop. Going grocery shopping while hungry can promote impulse purchases that are not always the best for your health or budget. First, shop the perimeter of the grocery store, where fresh foods such as fruits, vegetables, dairy, meat and fish usually are located. Limit your time in the center aisles, where more convenience foods are found. Look up and down the store shelves. Remember that the middle shelf often has higher-priced products. Try the store/generic brands. They can be just as good as a brand name, but they may be lower in price. Consider purchasing larger amounts of food, such as meat. Meat can be divided into recipe-sized portions and frozen for use later. Buy fresh fruits and vegetables that are in season. They will be of higher quality and usually lower price. Be aware of store specials, and use coupons for foods you will use. Many stores have fliers in the store and coupons online. Watch the store’s checkout monitor to make sure you are being charged the correct price. Or check your receipt before leaving the store. 1. True or False? Going to the grocery store while hungry can lead to impulse purchases. 2. “Fat free” on a food product means how much fat is in that product? 3. True or False? The serving size on a product’s nutrition label indicates how much food is in the entire package. 4. How are the ingredients listed on a food product’s nutrition label? Select firm, crisp, bright-colored vegetables that are heavy for their size. Look for firm, bright/appropriately colored fruits. Avoid fruits and vegetables with bruises, cuts or other blemishes. When fresh foods aren’t available, try frozen, canned or dried fruits and vegetables. Choose canned fruits in water or juice, not heavy syrup. Compare the sodium content in canned vegetables, and pick the lowest per serving. What Does “Free” or “Low” Mean on a Product? Some foods are labeled “fat-free” or “low-sodium.” However, fat-free doesn’t necessarily mean the product contains no fat. The “fat-free” label designation means the food has 0.5 gram of fat or less per serving. A low-sodium food has 140 milligrams or less of sodium per serving. “Free” means a food has a trivial amount of the specified nutrient. “Reduced” or “Less” means the food has 25 percent less of a specific nutrient than the regular version of the food (based on a 100-gram portion). Nutrition facts panels are found on food packaging and tell us what nutrients are in a food product. They are great tools to help us make more healthful choices. 2. Look at the number of calories in one serving. The rest of the information on the label is based on one serving. 3. Compare the amount of fat, saturated fat, cholesterol and sodium to the total amount recommended (see information at the bottom of label or % Daily Value). Try to minimize trans fat in your diet. Eating too much of these may increase your risk of developing chronic diseases. Eating too much saturated fat and/or trans fat, for example, may increase your risk of heart disease. 4. Check the amounts of dietary fiber, vitamin A, vitamin C, calcium and iron. Getting enough of these nutrients in your diet may lower your chances of developing some diseases/conditions. For instance, getting enough calcium may help lower your risk of developing osteoporosis, a condition of weakened, fragile bones. 5. Check out the % Daily Value. 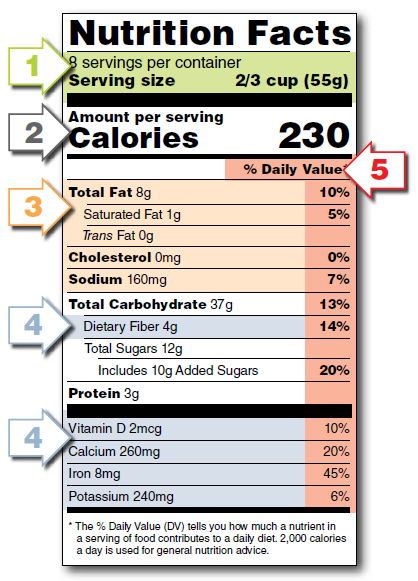 Food labels list percentages of the recommended daily intakes of several nutrients. The numbers are based on a 2,000-calorie diet and are used for adults who are age 18 or older. If you consume more or less than 2,000 calories per day, you still can use % Daily Values as a reference. Ingredients are listed from the items present in the greatest amount to the least amount by weight. By looking at the ingredients, you can get a general idea of the healthfulness of a product. The nutrient label and ingredient list can be used to compare products to choose the one that best suits your needs. Read through the recipes and check your supplies to see what and how much you need. Adjust the list based on your supplies and preferences. In a skillet, cook ground beef until brown and crumbly. Drain thoroughly and place in slow cooker. Add water, onion and chili sauce; mix well. Cook on low for four to six hours, until onions are tender. Serve on buns or with tortilla chips. Cook pasta according to package directions. Drain. Rinse with cold water and place in a medium-sized bowl. Add undrained three-bean salad, tomatoes and dill. Mix gently, cover and chill. Cook pasta according to package directions. Drain pasta and return to pan. Add oil; stir in cheese, tomatoes, sweet pepper and spinach. Season with salt and pepper to taste. Serve immediately. In a large skillet, simmer chicken in ¼ cup of salad dressing over medium-low heat until chicken is cooked thoroughly (165 F). Toss greens, strawberries and chicken in a large bowl with remaining dressing. Serve.